James Rodriguez has reportedly told Luka Modric he plans to be back at Real Madrid next season amid transfer links with Liverpool and Arsenal. 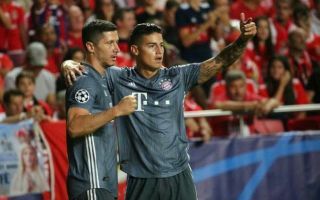 The Colombia international is in the second season of a two-year loan at Bayern Munich after some struggles in his time at the Bernabeu. It is unsurprising, therefore, that Rodriguez has been linked with other big clubs around Europe, including some from the Premier League. One recent Don Balon report claimed Liverpool were preparing a £44million bid for the 27-year-old, but it now seems he could be on his way back to Spain. That’s according to another report from Don Balon, which claims Rodriguez has told his Madrid team-mate Modric that he’s set to play for Real again next season despite also being a target for Liverpool and Arsenal. Much has changed since he left Los Blancos last season, with Zinedine Zidane no longer manager, meaning there could be a good chance of a fresh start for him. It could be that Madrid would now really benefit from Rodriguez’s presence in the squad after the exit of Cristiano Ronaldo left them lacking a bit of spark up front. This is a blow for Liverpool and Arsenal, however, with both sides no doubt ready to benefit from some investment in their attack. Arsenal are particularly short in that area after the recent injury to Danny Welbeck, while players like Alex Iwobi, Mesut Ozil and Henrikh Mkhitaryan struggle to convince on a regular basis. Liverpool could also do with more depth behind their current first choice front three, with the likes of Mohamed Salah and Roberto Firmino both suffering dips in form this season.